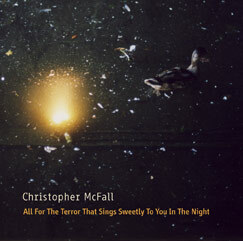 Blackbirds, the sedentary barnacles of innumerable downtown districts, are the stuff of sound artist Christopher McFall’s first foray on 1000fussler. In keeping with the methods found in past efforts, McFall forgoes cerebral mechanisms, suppresses his intentions just enough, and largely resists the temptation of parasitic meaning and full signification. While McFall deals in the constitutive ambiguity of everyday situations, the recordings aren’t easily reduced to a tendentious respect for the banal and desacralized elements of experience. The noxious works presented here, lined with subterranean currents, and spun in eccentric orbits, manage to show, through their intense duration, persistent repetition, uneasy palpitations between clarity and obscurity, and avoidance of common sense and feeling, a certain fidelity to the event. Beyond this, the main appeal of the work lies in the sensitive nature of the material and the alienated perspective of its mechanical realisation. This duality remains strong throughout the albums some twenty minutes and is never wholly resolved. If anything, such shiftiness is only pushed to greater extremes, particularly on the final track, “Endurance”, where a faceless force digs like a demon and eventually descends over discarded rhythmic remnants that have yet to be picked clean whilst sly, dismal textures twist overtop.